After a year of continued growth and new product innovation, Puck Custom Enterprises (PCE), a leading Iowa-based manufacturer of manure application equipment, is expected to continue its upward trend in 2018. This year, the company looks to build on the growth it experienced in the last few months, which included a new location and equipment innovations. Last fall, Puck Custom Enterprises opened a new retail and service store in Farley, Iowa, just 10 miles west of Dubuque. This location sells new and used equipment, has an expansive parts inventory, and is able to perform custom modifications, along with placing a strong emphasis on service. 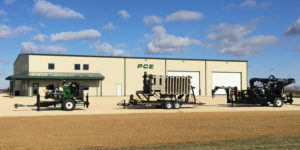 While PCE has long sold manure applicator and agitation equipment in the area, the Dubuque location allows it to bring a higher level of service to customers nearby. The opportunity to better serve eastern Iowa and neighboring states, as well as to offer next-day part delivery, spurred PCE’s interest in developing another retail location. According to Puck, the new location has generated excitement in the Dubuque area. Along with Farley and its Manning, Iowa headquarters, Puck Custom Enterprises also has a physical presence in Sioux Falls, South Dakota and overseas in Osik, Croatia. PCE’s international headquarters in Croatia has more of a revolutionary aim, working with a growing pork production industry to solve farmers’ manure application problems. Many people there use small tractors and wagons to haul their manure, so Puck Custom Enterprises’ equipment and accompanying software brings a huge upgrade. The company also advocates for manure injection, a practice that is not yet the norm in eastern Europe. Closer to home, PCE continues to grow its original Manning, Iowa campus, where the bulk of the company’s welding and fabrication takes place. Last year, it added more staff and shop equipment, as well as more inventory to support its growing customer base. The implementation of Cat Tier 4 Final engines has also brought a shift in equipment design in order to accommodate the more efficient motors. With a burgeoning new location and several developments on the horizon, Puck Custom Enterprises is looking forward to the year ahead. The company hopes to continue expanding, while also maintaining its focus on providing reliable service to its customers.